The boom was not as big as is widely thought; it has on the whole been sensibly handled; and in any case it is not yet over. Edwards has of course never heard of Strayanomics, but his arguments are recognizable in their opposition to most of what has been written on this site in its brief history. The boom was very big, the biggest in Australia’s history; it has not been handled in anything like an ideal fashion; it will, of course, not end overnight, but it is unequivocally in the process of ending. Readers are at liberty to explore my reasons for these positions on the blog. Or they could turn to the RBA itself, since, as Leith van Onselen of Macrobusiness noted in his takedown of ‘Mr Rainbow’ this morning, the RBA’s own research contradicts Edwards’ message. Displaying scant regard for the timing of Edwards’ feel-good riposte to the merchants of doom, the slide in steel and iron ore futures continued on its merry way today. Here’s the daily piece from Reuters. No sign of a turnaround yet. And here’s what spot looks like. As such, any indication of wavering resolve is cause for excitement. There was one such indication yesterday when the Wall Street Journal reported that pressure was mounting to replace the reform-minded chief of the People’s Bank of China (China’s central bank). If true, it could usher in a more accommodative monetary policy stance, which should support China’s economy and its demand for raw materials. The PBoC has denied this, for what’s worth, but the situation should be watched closely. Chinese stocks greeted the news with some enthusiasm, however sadly the same cannot be said of the steel and iron ore.
On steel, Bloomberg has a fascinating story today which provides a neat follow-on from a point I made earlier in the week. The September HSBC PMI showed considerable buoyancy in exports, which I suggested may partially reflect the accelarating offloading of unwanted steel products on to global markets by Chinese mills, which seems to be gathering speed as domestic prices collapse. After the Chinese steel industry expanded by 50 percent since 2010 to keep up with surging demand, mills can produce 210 million metric tons more than the market needs and a quarter of capacity sits idle, according to data compiled by Bloomberg Intelligence. With economic growth slowing, producers are reluctant to close plants, forcing a record pace of sales overseas, where competitors accuse China of dumping. China, which produces almost half the world’s steel, shipped 52.4 million tons in the first eight months of this year, up 36 percent from a year earlier and more than the 42.5 million exported over the same period in 2007, when sales were at an all-time high, government data show. By year-end, the 2014 total may reach 85 million tons, according to Hu Yanping, an analyst at custeel.com, a researcher in Beijing. That’s 44 percent more than the 2007 record of 59 million tons. More of the surplus is heading to other countries. In the U.S., the sixth-largest buyer of Chinese steel, hot-rolled coil imports cost about $683 a ton on Sept. 19, the most since June 2012, according to data from Metal Bulletin. That compares with $487.50 for Chinese hot rolled coil exported on a free-on-board basis, the lowest since November 2009, the data show. The premium of about $196 is the biggest since December 2008. As the premium collapses, the calls for protection from Chinese imports will grow louder, and rightly so. What is left of the US steel industry has no obligation to bail out beleaguered Chinese mills who’ve wrecked their margins after years of capacity over-investment. Indeed. China is set to produce a bit above 800 million tonnes of steel this year. Australia’s iron ore expansions have been undertaken on the assumption that this rises to a billion tonnes by 2020. As it stands, this looks very unlikely to transpire without absolutely eviscerating the world price (forcing some production to idle and therefore preventing the increase in output). The Final Budget Outcome for 2013-2014 is out and showed a substantial deterioration from 2012-2013, roughly in line with the government’s expectations in May. Unfortunately, although the iron ore price slid throughout the last half of FY2014, it is looking like being much lower this coming financial year (see above spot price chart), setting Hockey up for an even worse 2014-2015 budget. Those who thought the Treasurer was low-balling forecasts to engineer a unexpected improvement will be disappointed (for instance). Still, they’ll always have John Edwards to turn to if things get really glum. 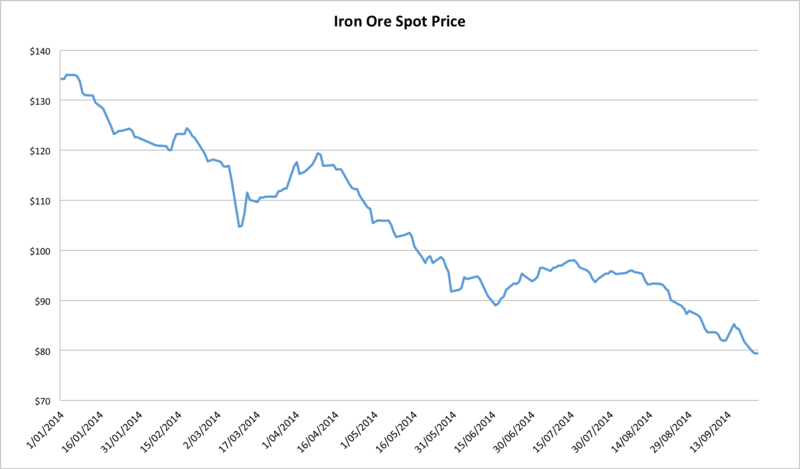 This entry was posted in Uncategorized and tagged Australia, China, iron ore on September 25, 2014 by MJV.